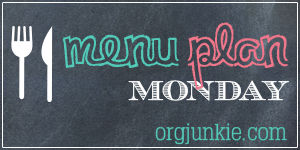 This week’s menu is a little different. Phase 2 of 80 Day Obsession introduces a “Refeed Day” where you are allowed what Autumn calls dirty carbs. Think white bread and pasta. As someone who loves carbs I am looking forward to Refeed day! But, we are also leaving for our trip to Grand Cayman soon so I wanted to add in some “Deplete Days” where we lower our carbs and increase protein to look extra beach ready. So we’ll be enjoying Refeed day followed by 4 Deplete days. It’s all normal food so if you’re not following 80 Day Obsession you can still find ideas for your meal planning. The purpose of Refeed day is to replenish glycogen stores in your muscles so you can work out harder and get better results. I’m just excited to get more carbs! For Refeed day you choose carbs from the supplemental yellow list. Instead of whole grain carbs you are allowed white rice, pretzels, and white pasta. There are also a number of desserts on the list from the Fixate Cookbook available through Beachbody on Demand. The end of 80 Day Obsession includes an optional “Peak Week” where you add 4 Deplete Days to your meal plan. According to the plan materials, reducing carbs and increasing protein taps glycogen from your muscles, causing you to look more ripped. The program emphasizes that this is a temporary strategy. Since we’re heading out on vacation I’ve decided to work in some Deplete days before our trip.